Playing a main role during the Milan Design Week 2017, the so-called Millenial Pink is now a trend in the design world thanks to its versatility. The trend comes from the fashion sector, where this colour was already one of the most used. An example was the Milan Design Week of this year, where many designers used it for different applications.The proposal of the French designer Marc Ange, “Le Refuge” stood out above the rest. 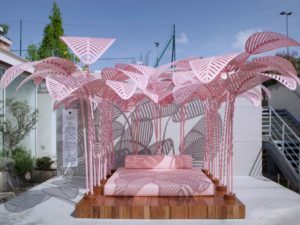 His design is composed by a bed entirely millenial pink that matches with a leaf canopy of this same tone, forming a unique and innovative space. Wow!